Burgers' Smokehouse was founded in 1952 by E.M. Burger in the town of California, Missouri. Like many of the artisan bacon producers we work with, Burger's original business was country ham. Today, though, bacon is the business. Burgers' steak bacon is dry cured, which means it's cured in salt and gets intensely flavorful. The pork bellies are rubbed with brown sugar then smoked over hickory for 24 hours. The flavor is sweet, smoky, meaty and very savory. These hardy cuts are a quarter inch thick, sturdy enough to go straight on the grill, which is where the name "steak bacon" comes from. Not just a side note on a breakfast plate, these steaks can be the star of dinner. 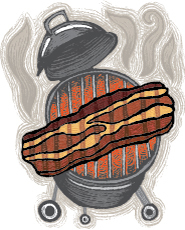 If you do cook them on the grill — which tastes fantastic, by the way — keep a spray bottle of water handy to quelch the flare-ups that might occur when the bacon fat drips on the fire.